We were blest with a warm Sunday 11th November on which to conduct our annual Remembrance Day Service at St Marys RSL guns-memorial. Approximately 120 assembled for the traditionally simple Service during which our Patron, Councillor Greg Davies and his partner, Kerrie Martin (Editor, Nepean News) were able to deliver their own authored poem, "The Lucky One" � very relevant for the occasion. We were also fortunate to be able to display �our own Remembrance Poppy� � a �portrait� developed as part of an entry by Ava Lansley of Erskine Park High School (Year 10), in our Colin Shepherd OAM Memorial School Scholarship program for this year. Around 250 attended our annual Commemoration of Vietnam Veterans Day at our Guns Memorial in St Marys on Saturday August 18th at 5.00pm. With the usual spectacular support from 1/15 Royal NSW Lancers Regiment (who provided the Band, led by Cpl Arthur Crellin, and Catafalque Party, led by Cpl Stuart Gordon) and the Sunset Station Singers, President Greg Cant MC�d the Service. Together Sqn Ldr Julie Hackett (niece of our Welfare co-ordinator John Foeken), Maj David Neal (Ops Offr 1/15 RNSWL) and Capt Hatton (representing Capt Alex Kilgor of 1ACU Penrith), placed the remembrance candles to represent participation in the Vietnam Conflict by the Australian Navy, Army and Air Force. In a departure from previous years� programs, relevant poems were recited and we heard a recording of Reg Lindsay�s daughter, Dianne�s new single �In the Shadow of the Horseshoe�. The Lament was again beautifully played by our regular Piper, Andrew Iverson. After Federal Member for Lindsay and Patron of the Train, Mr David Bradbury MP delivered the address, it was pleasing to see the various local schools (with whom we have developed a close relationship through the RSL Sub-Branch�s Colin Shepherd OAM Memorial School Scholarship Program and presentations to Year 10 students and school ANZAC Addresses) also attend and lay a floral tribute to the fallen. After the Service, those who could, joined together for refreshments and a delicious meal. 2000 brave souls tested the early morning chill to attend a magnificent Service at St Marys � by far the largest gathering at the Guns. The added facility of a large video screen enabled all who wished a close-up view of every moment. Gary Fizzell MC�d the Service and was ably supported by the St Marys Brass Band, along with Ken Bradley on Trumpet, Andrew Iverson (from the St Marys Pipes & Drums) on Pipes and the Sunset Station Singers. 5CER again provided a skilful & resplendent Catafalque Party, while 21ACU provided enthusiastic cadets to form a Colour Party to present the ANZAC focus with both nations flags on banners. Special guests included David Bradbury, Doug Cameron, Tanya Davies, Mayor (& Patron) Greg Davies, patron Jackie Greenow and Allyson Gavin amongst many other keen supporters of the sub-Branch. All were invited to breakfast in the club after the Service. 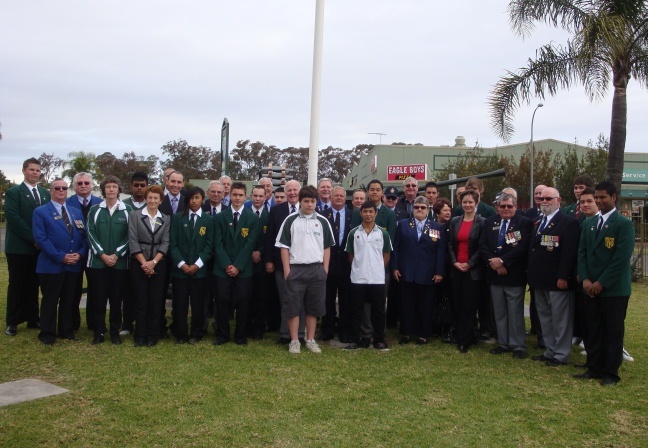 Our 2012 ANZAC Sunday march and Service proved a very successful commemoration of ANZAC. A good representation of Sub-Branch members in the march were well supported by an excellent showing from local schools and community groups as well as our own Youth Club and both St Marys bands which performed magnificently. The march finished at Victoria Park where past-President, Gary Fizzell, MC�d the Service. State Member for Mulgoa, Tanya Davies, presented a though-provoking Address around the theme of "freedom to �", focusing on encouraging vision in our youth based on achievements of the passing generations. The rain held off nicely to allow the Service to be completed before many returned to the RSL Club for refreshments and a chat. The threatened poor weather conditions gave way early to a sunny day to shine on our successful annual service at St Marys RSL to commemorate those Australian veterans and fallen from the Anglo-Boer War of 1899-1902. A small but enthusiastic crowd of 65 were introduced to Banjo Patterson�s poem �Our Own Flag�, along with the traditional Prayers of Remembrance. Federal Member for Lindsay, Mr David Bradbury and State Member for Mulgoa Mrs Tanya Davies honoured the assembled group and, along with St Marys RSL Patrons, Penrith Mayor Greg Davies and Deputy Mayor Jackie Greenow, we were provided with a truly local (St Marys) focus through an address by Mrs Norma Thorburn of the St Marys Historical Society around the theme �St Marys in the Boer War�. Please mouse over photos to view captions. The weather held off to provide a glorious day for our annual Anzac march and Service. Numbers appear to be steadily growing, with a large representation of both sub-Branch members and others from the general community - it was pleasing to see the continued community support. The march, under our submarine commander, took us on an improved route down the Great Western Highway to the surprise of those looking in the opposite direction! Gary Fizzell guided the Service well & David Bradbury presented a welcome Address. Many Service, ex-Service, schools and other community groups, as well as a large number of individuals, laid wreaths and tributes. The Catafalque Party from 5CER did a marvellous job and we were well supported by the two bands and choir. The day was complete when all were invited to join together over a light meal and drink at the RSL Club after the Service. Thank you to all who took the time to join in this important commemorative Service. 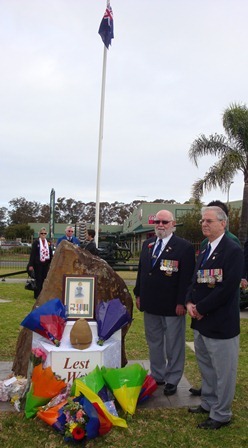 In conjunction with the annual National Boer War Day commemorations on Sunday 29 May, a special Service was conducted at St Marys RSL sub-Branch�s Remembrance Stone in the grounds of St Marys RSL Club. Commencing at 11.00am, and on this occasion, with special involvement from Year 10 students from Colyton High School Trade School, the Service commemorated the events of 1899 -1902 in South Africa � the first conflict to involve our Nation � a conflict which provided the origins of Australia�s military culture and military history, where around 20,000 Australian men and women volunteered and around 1,000 Australians lost their lives to battle or disease. Resulting from great assistance from our own sub-Branch members, the tremendous involvement from the Colyton High School Trade School students, and the significant support from the local media, over 120 turned out for a successful Service. Several descendants of Boer War veterans attended & participated in the Service. One descendant, Janet Jones, placed her Grandfather�s medals & photo against the stone, along with a Pith Helmet from the War. These became our point of focus for the Service. DOWNLOAD Order of Service, DOWNLOAD Brochure.